I begin writing to you from a superb anchorage next to a marked shipwreck inside of Friday Harbor. A dozen other boats share this anchorage but only a few are occupied with cruisers. For short trips to shore with the pup I have elected to inflate the paddleboard and simply paddle to a nearby beach. It’s much easier than inflating the dinghy and outfitting it with all of the necessary equipment to make it seaworthy. It takes considerably less time and effort to inflate a paddle board and it’s more enjoyable for the both of us. I’m still trying to decide how I will keep it on shore while I wander town but I guess I will figure that out later. It’s a peaceful anchorage but it bustles with ferry and floatplane traffic, not to mention many boats in and out during the day. Nonetheless it is more quiet than Port Townsend and Seattle. I allowed myself two days to get to this little harbor. 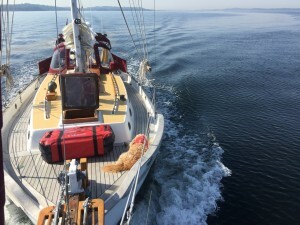 The first day I partially motored up Puget Sound until the winds picked up and I could tack a couple of times to get into Port Townsend. It was a nice trip with plenty of sun and only a handful of halibut fishermen to add something less than mundane on the passage. I especially liked the moments where a fisherman decided to pass a dozen yards at my bow instead of intelligently passing on my stern. Once I made my final tack into Port Townsend I came across a dinghy race, which was in between my anchorage and my point of sail. With respect to the race, I decided to trim my sails to reduce speed and then go around the mark keeping out of the way of the race boats. Finally I made a tack into the irons with only a small amount of jib, furled it up, which slowed Satori to a stop and finally dropped anchor. 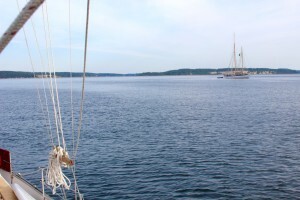 There is nothing more fun than to maneuver under sail with trust that the motor is not needed to get into mooring. I arrived early enough to enjoy summer like conditions with little winds. It was my first time away from the marina with my new wetsuit and snorkel gear so I tried out a dive to clean the hull of a year and a half of growth. 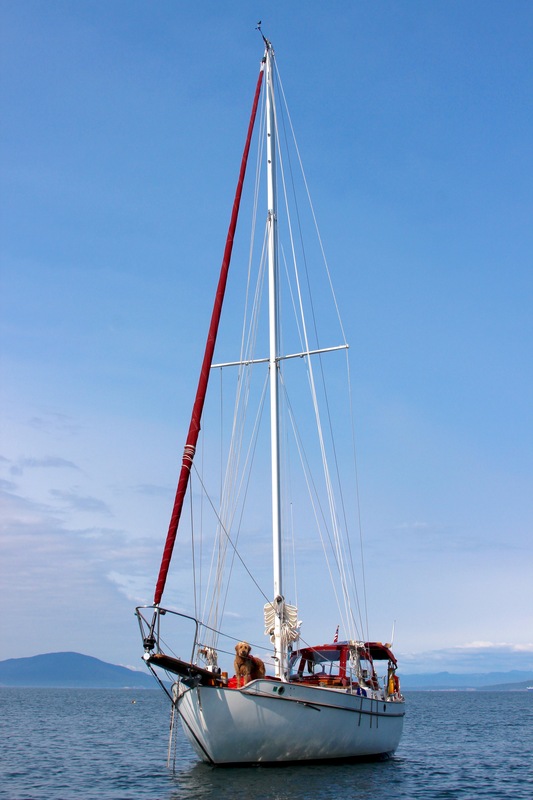 I also rigged the Aries windvane autopilot for the next day’s crossing of Admiralty Inlet and the Strait of Juan de Fuca. The water was cold but I managed to stay comfortable for about an hour to get much of the growth removed. My first dive was a success, other than perhaps needing a few extra pounds of ballast for neutral buoyancy. I didn’t spend any time in town since I had everything I needed on the boat and was more concerned about preparing for the next days adventure. It would be the first time operating the vane gear and I was also looking at crossing during an outgoing tide against a westerly wind. It’s common for the winds to blow freshly in Admiralty Inlet so I was expecting up to twenty-five knots. The next morning I slowly worked my way around the boat to ready for lifting anchor and casting off under sail. The winds were around twelve knots and blowing me away from the shoreline. No matter how much I prepared for the casting off, I still managed to screw up my mainsail halyard routing which caused me to change tacks more than once. Once I was off and underway, I realized that the main would not raise without fixing the issue. A couple of tries heading right towards the ferry terminal and the main was up and the sails were set. Now to get the Aries vane gear working, but not without some fiddling and learning first. Once I was heading out towards Point Wilson I realized that there were some obstacles to maneuver around. First an oncoming towing tug with it’s barge on a cable in my way. To tack away from the barge meant heading abruptly into breakers and risking getting pounded near the point buoy. Still I did my tack to let the tug know I was avoiding it but was also heading towards the breakers. With enough time to make another tack to clear the tug I was back on course and sailing away from the tide rips. I rarely cross in front of a ship in the traffic lanes so I carefully kept close hauled but kept the bow pointing towards the tug until we were within shouting distance, then was able to bear away at it’s stern. Then another large cargo ship in the westbound lane. I have to avoid it as well and avoid heading too far downwind. Once it was far enough west I could point Satori on her course under steering vane and enjoy an exciting sail to weather for a bit. Seas broke on her bow at every wave. Some splashed water over her deck. 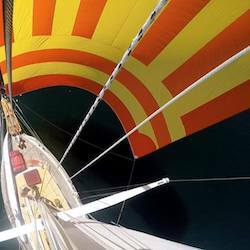 The winds rose to twenty knots at one point and I decided to reef the mainsail to balance her helm. I am still learning the reefing technique and was not able to get the sail ties secured so left it bagged at the base but still reduced the pressure on the helm. Never have I had such an exciting sail than at that moment. It was likely what it feels like in the ocean with similar winds. Waves rolled in, some big enough to bring water from the bow into the cockpit. 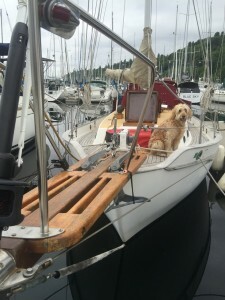 Satori found her rhythm and kept pushing through at five to six knots. Over ground we were almost seven knots and enjoying the excitement. 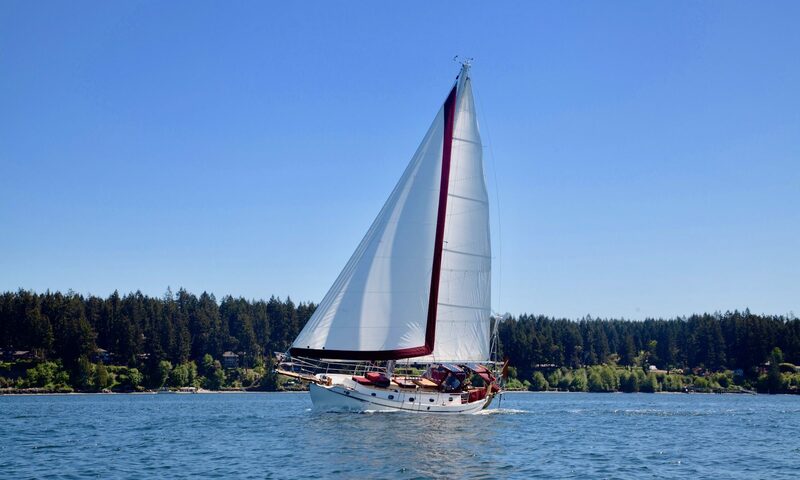 Past Admiralty Inlet and into the strait the winds eased to twelve knots so the main’s reef was shaken out and back up to full sail. The winds were also on the port quarter so I had to devise a boom preventer to keep it from rattling itself away. 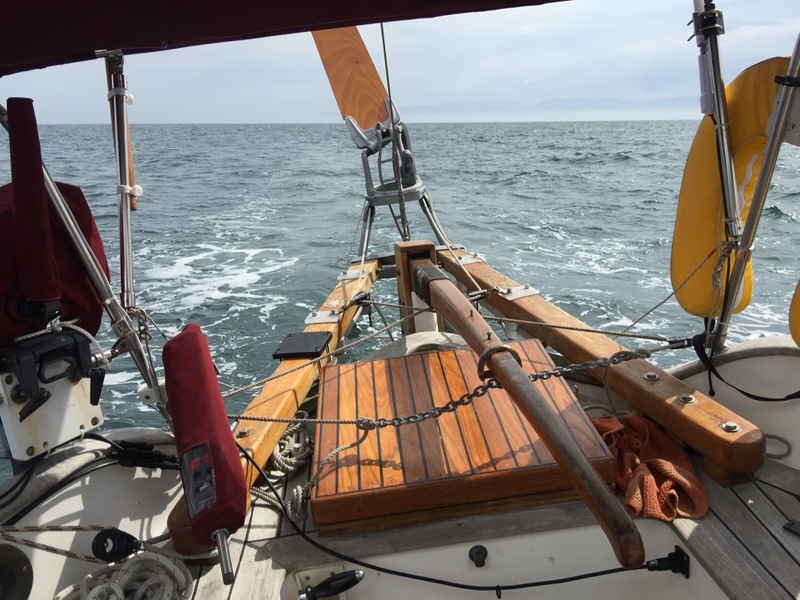 It was obvious that a whisker pole could have helped in the same way for the jib but it was still doing well on most rolls as long as the winds stayed above twelve knots. I was able to stay on the same course with some minor course corrections to the vane gear all the way to the San Juan Channel. Then of course the winds died, or shifted, or the current would sweep the boat and mess up the course. 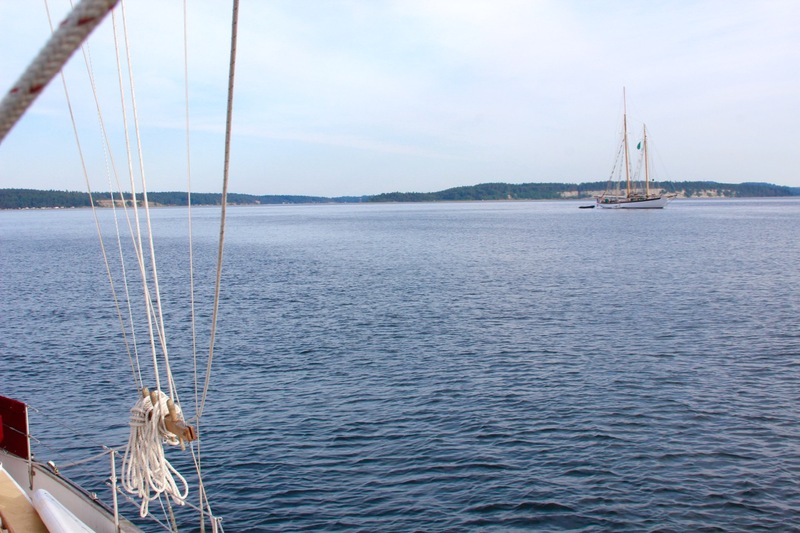 I was able to sail through the channel but out the other end I continued to Friday Harbor under auxiliary power. 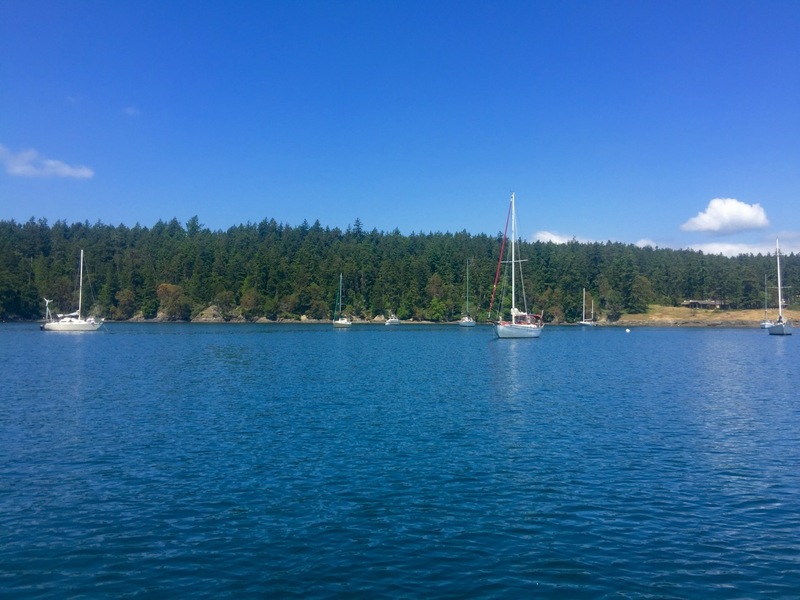 There is a small harbor just east of the marina that provides some protection from wind and current, but is exposed to boat traffic just the same as Port Townsend. There is little sanctuary from commercial traffic here, but the town was a perfect place to enjoy a new place while beginning my work week. After two nights, I pull anchor and sailed off to the next mooring. Pulling anchor and raising sails was the plan but as soon as I left the harbor the winds died and I was resolved to drifting until I dropped sails and ran under auxiliary once again. I expected winds to constantly shift direction and speed in the protected bays and harbors, so going with the engine was out of necessity. I checked out a south bay on Shaw Island but it was unappealing due to the southern exposure and bordered on private land. Big houses shadowed the beach so I decided that there were better options. 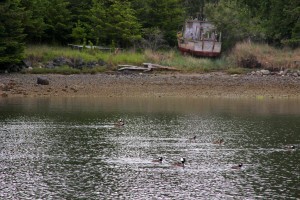 Another half hour of motoring north brought me to Blind Bay on Shaw Island. It is inset enough to be fully protected from ferry traffic and close enough to be able to paddle around the point to visit the general store next to the ferry terminal. 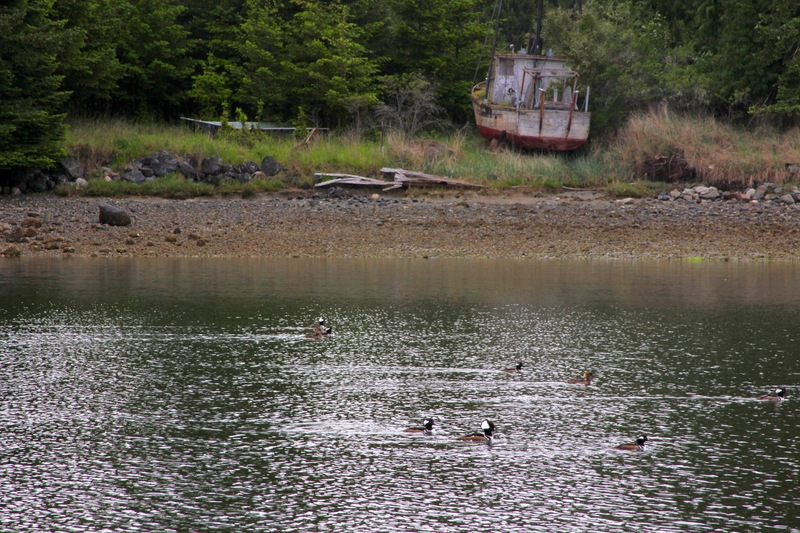 There are private moorings but for the most part this bay has just a few temporary residents. A strong cellular wifi signal was present so this would be our home for two nights. Upon exploring the reef and Blind Island I stumbled upon a nice stash of Pacific Oysters. The first night while taking Sasha out for a swim we enjoyed two as part of dinner. 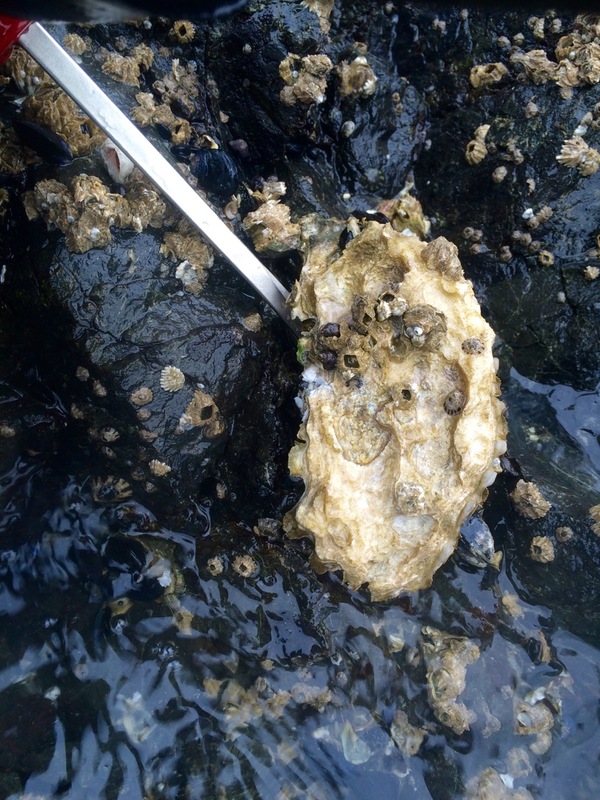 I decided that it was worth a second night stay just to harvest a belly full of oysters exposed at low tide on the reefs and island. To take the harvest seriously I wore my wetsuit, gloves and booties so I could wade into the tide pools. I brought a big screwdriver to assist in the prying of these strongly adhered shells so I could shuck them back at the boat. Technically it is not legal to take the shells but the next morning I brought them back and scattered them around the reef again so the ecosystem living in the shell could thrive again. I did stop off at the general store on Wednesday but they were closed, but I went back on Thursday hopeful of fresh baked goods. To my dismay they only had generic grocery goods with some tourist items available, due to being early season and all. I settled for their selection and brought back breakfast and snack foods instead. It was pretty cloudy during these two days, which meant the need for the diesel stove. It also meant that the solar panels were not doing well keeping up with my demand. Apparently a 15″ Macbook Pro eats up a lot of amps. The second day was partly cloudy so the batteries were able to make it back up to eighty percent. 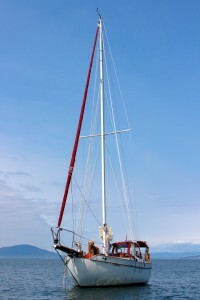 After work I prepared the boat for a trip around Lopez Island eastward. I really needed to get further south so getting home was not going to take too long. 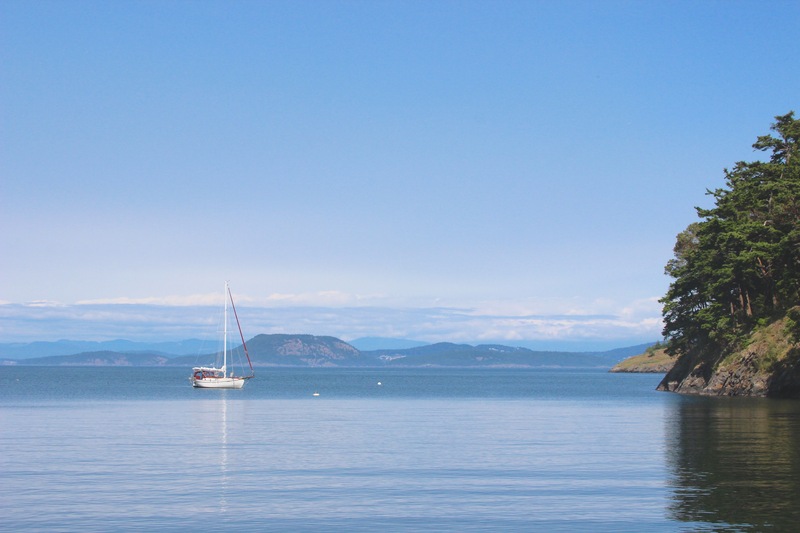 Plus there is a bay that seemed like a perfect place to spend the last night in the San Juans on the southeastern side, right around the point from crossing the Strait of Juan de Fuca and into Admiralty Inlet. Crossing the north end of Lopez I was getting a nice southerly breeze that guided Satori towards Rosario Strait but after entering Lopez Sound the winds were not only lighter but coming straight to where I wanted to go. I figured this was a good time to use auxiliary and also get the batteries charged while I head towards the new anchorage. 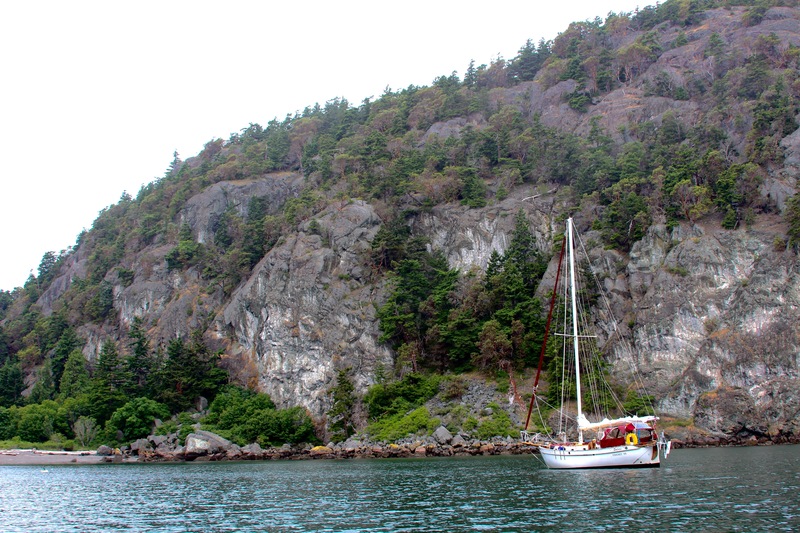 I was delighted to go through Lopez Pass to exit the sound into Rosario Strait with such steep walls on the islets and not a single boat in sight. Another thirty minutes and I was dropping the RPMs to line up the anchorage in Watmough Bay. 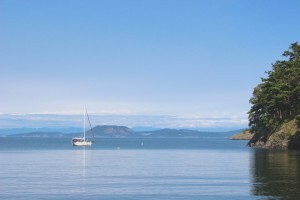 It is perhaps the most stunning of all bays in the San Juans. I was concerned about the availability of internet and at first did not seem to get a signal, but after rebooting the network and cellular hotspot I was back in business. This is all possible thanks to Verizon’s cellular data plan. The anchorage is nicely protected from winds but it also had some rolling from container ships that travel down Rosario Strait. Most of the time Satori would be stern on when a set came rolling in but on occasion she would be in mid-swing and taking the waves on her quarter or beam. Still not as bad as Friday Harbor or Port Townsend’s ferry and powerboat traffic however. 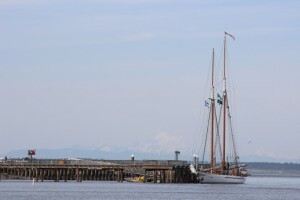 I wanted to get home on Friday evening but was also entertaining the idea of sailing into Port Townsend and spending the night there, to complete the final part of the trip into Puget Sound on Saturday morning. I did not want to come into port in the dark, nor did I want to deal with southerly winds at anchor. After leaving anchor under sail at 5pm on Friday, I was able to sail due south until the wind turned to my bow and became calm. At that point I dropped sails and began to motor. As I passed Smith Island heading south, the currents and waves began to build and the wind shifted to southwest. 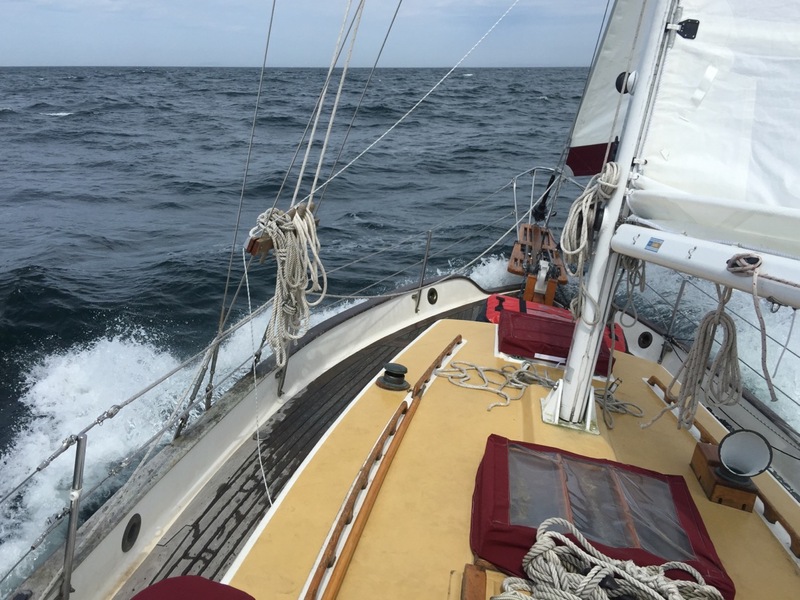 At that point the winds began to build once again but I was at a point of sail that would have caused me to fight off land or tack back west, so I opted to maintain auxiliary power until I could reach or head downwind. In retrospect I believe I made a navigational error when deciding to cross Admiralty Inlet from Admiralty Head southward towards Point Wilson. My main reason for this decision was to be able to time the commercial traffic correctly to get through the east and west lanes without coming too close to an oncoming vessel. My mistake cost me a considerable amount of time and a period of time in a very heavy sea state. The closer I came to Admiralty Head, the seas built to a point where I have not experienced before. I cannot accurately judge the wave size but there were some big enough to cause Satori lose her steerage while the wave passed under her and would cause her to lose control from the heavy surge of water flowing under her. In order to maintain control and keep stern-on to the oncoming seas, I continued my course around the point at Fort Casey and then back northeast along the shoreline of Whidbey Island. Keeping stern to the waves was my best strategy, but the tide rips were also pushing me toward shore. At some point I had to begin to turn southward and expose my beam to these steep and swift seas. Eventually after slow progress and difficult timing I began to work southward. Several times I was hit by a confused sea state that caused the boat to lay close to her rail, but never a moment that put water over her deck. By the time I had crossed the inlet, navigating past oncoming commercial traffic, it was getting dark. Winds shifted from the west and I decided to keep going into Puget Sound. I was still in heavy seas east of Port Townsend and a steady twenty knot broad reaching wind. To take advantage of the winds I unfurled a small portion of my jib, which pushed me along at five knots and occasionally hitting six knots with a gust. Although Satori rocked from the following seas, I knew I had passed the most difficult part and rode the wind until I felt the winds calm and the seas became manageable. Once heading southward around Marrowstone Island the winds were less than six knots and I could set the tiller pilot to take the helm in an almost glassy sea state. 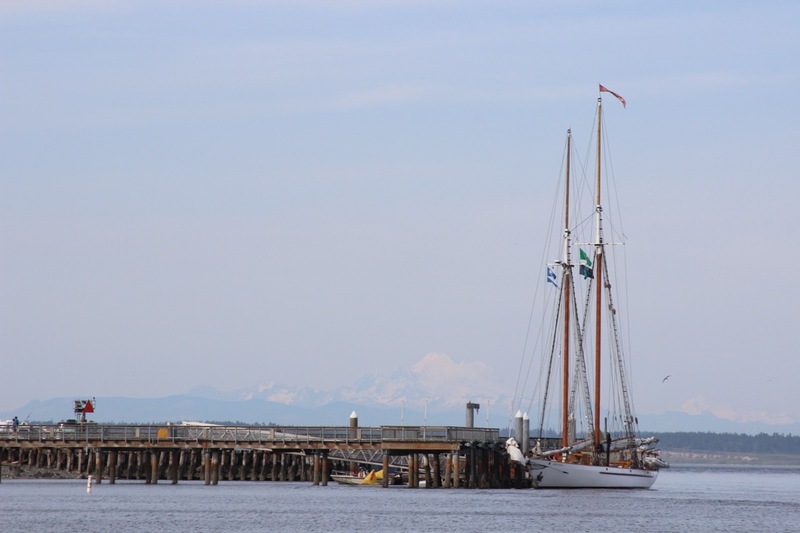 It was still another six hours of motoring to get Satori back into her permanent mooring at Shilshole. Most of the remaining trip was keeping a lookout for commercial traffic and identifying the aides to navigation throughout the Sound. At one point while I was making hot chocolate in the cabin, I noticed a large empty container ship overtaking me within an eighth of a mile at my stern. By that point I did not have much time to do anything but take the helm and put it hard over to give a wide berth. At first I could not understand why this ship came unnoticed but then realized it’s ship’s name from coming northbound not thirty minutes earlier. It must have gone north and u-turned south again, giving me no more than ten minutes before the u-turn and overtaking me. I did not receive a radio call and by the time I was heading away from it, I was getting some flashing lights coming from the crew out of deck. I was baffled that this large ship was using flashlights instead of VHF to communicate. Once it was clearly at my bow I next had to feel the onset of the ships wake and put the helm hard over again to take the waves at the bow. Although not as great as the tide rips, they still caused water to break over Satori’s deck and woke me from a tired slump. Another couple of hours and I was heading into port. A perfect turn and reversed throttle placed Satori at her slip and we slept a quiet morning’s sleep until noon. 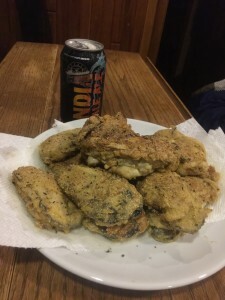 Now that I’m safely tied to the dock and able to reel over the entire week, I’ve managed to consider some new techniques on keeping safe while single handing in the Salish. I met the Salish’s most peaceful and bountiful anchorages, it’s most remote and scenic bays, it’s perfect winds, and not so perfect winds. Most of all I have learned her unforgiving tides and currents accompanied by the swell of the Pacific Ocean. For a man and his dog, with a forty-foot heavy displacement sailing vessel it is much less forgiving. Without considering the tide changes, I met Salish seas that most people will never encounter. To be so close to the water unable to see anything but the waves that surround me, while waiting for Satori to come out of a trough and over the crest of a rip tide wave. Satori kept me safe and she handled the seas like a champion yacht. In every situation I maintained enough control to safely navigate, and that is all that matters. Chalk this up as a learning experience and remember to time the tides next time.